Don’t forget! 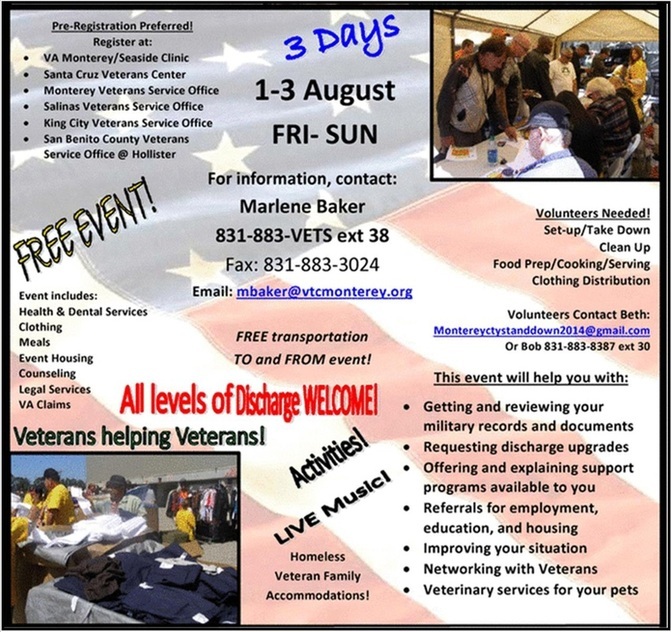 The Monterey County Homeless Veterans 2014 Stand Down is August 1-3 (Friday-Saturday-Sunday) from noon on Friday to noon on Sunday. For more information, please call Marlene Baker, Program Administrator, (831) 883-3024, ext. 38. We’ll see you there! The Housing Resource Center (HRC) will be a featured provider at the Monterey Stand Down and Veterans should visit the HRC booth and sign up for services. Veterans that need assistance with any legal issues–traffic violations, child support, misdemeanors and more–need to pre-register, and should come to HRC NO W to sign up for an appointment with legal council and/or to see a judge to have their fines reduced, or record cleaned up.